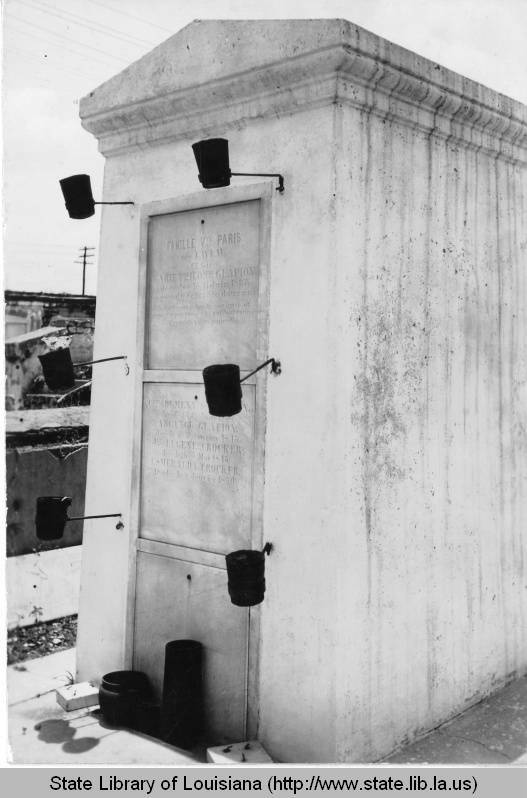 The Historic American Building Survey (HABS) collection at the Library of Congress contains several surveys of tombs in St. Louis Cemetery No. 1, in Faubourg Treme. 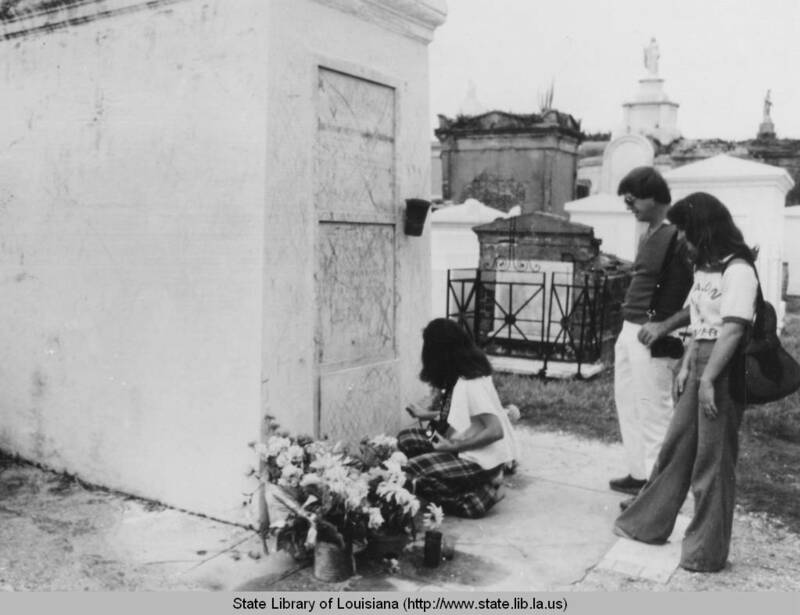 The Locoul family’s tomb is particularly interesting, because of the family’s links to Laura Plantation. St. Louis Cemetery No. 1 draws large numbers of tourists daily to Basin Street. The city opened the cemetery in 1789. St. Louis No. 1 replaced an earlier cemetery, St. Peter’s, in the Vieux Carre. So, the French tradition of above-ground burials in tombs and vaults allowed families a lot of creativity in designing their resting places. Therefore, individual tombs attract study. 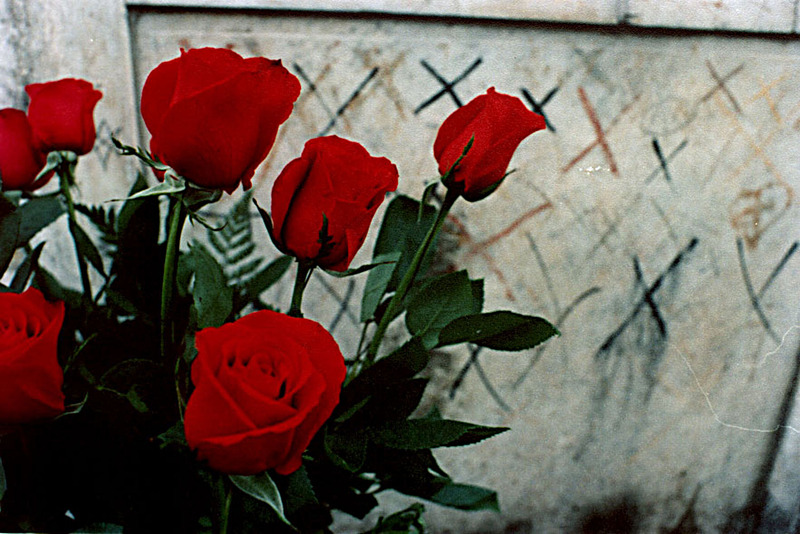 Catholics and Protestants buried their dead in St. Louis No. 1, until Christ Episcopal opened Girod Cemetery in 1822. Significance: The Locoul family owned the Laura Plantation on River Road between New Orleans and Baton Rouge. The family’s patriarch, George Raymond Locoul, arrived in New Orleans in 1821 and shortly thereafter married Elisabeth Duparc, whose family owned one of the largest sugar plantations in St. James Parish. Raymond himself had a lucrative wine importing business. From 1820 to 1920 the plantation was a main distribution point for French wines and other liquors, with a 10,000 bottle capacity. Raymond died in 1850 from yellow fever, leaving Elisabeth and their two children, Louis Raymond Emile and Mary Elisabeth Aimee. It was after his death the tomb was built, for the contagiousness of the disease prevented the body from being transported upriver to the family tomb. Elisabeth ran the plantation during the Civil War up until her death in 1882. The plantation later became the focus of a bitter property war between siblings Emile and Aimee. Since Aimee owned the sugar mill on the land, Emile built his own and subsequently named it after his daughter, Laura. Laura Locoul Gore would later go on to write a memoir, “Memories of the Old Plantation Home,” of the Locoul family’s history. The Locouls were Creole in heritage and one of the wealthiest families in Louisiana at the peak of the plantation’s production. The tomb puts that wealth on display by employing a slate and granite foundation and has some of the cemetery’s finest ironwork surrounding the tomb. The first image in the survey includes a map of St. Louis No. 1. The map shows the location in the cemetery of the Locoul tomb. Map of St. Louis Cemetery No 1 included in the HABS surveys of tombs in the cemetery. There are a number of HABS surveys on tombs in St. Louis No. 1. So, we’ll look at them as we go forward. In the meantime, if you’d like to visit St. Louis No. 1 and the Locoul tomb, check out my friends at Two Chicks Walking Tours.